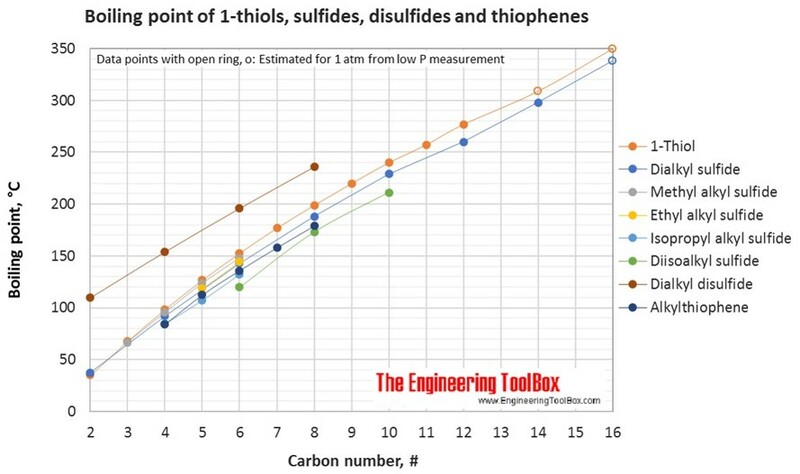 Boiling and melting points of thoils, sulfides, disulfides and thiophenes shown together with molecular structures, as well as molweights and density. 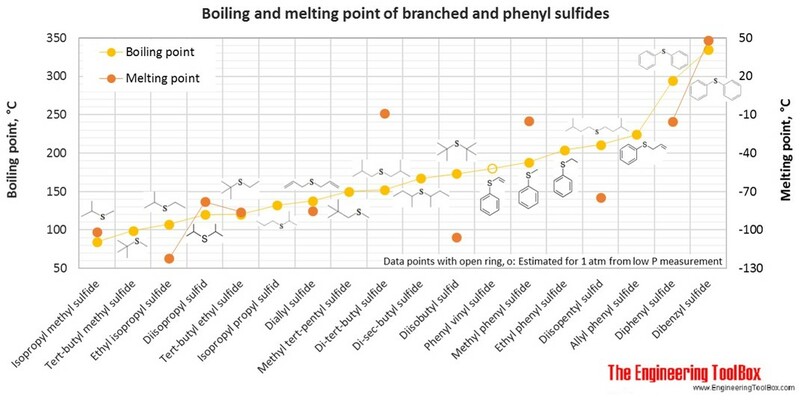 The figures below show the boiling and melting point for organic sulfur compounds as sulfides, disulfides, thiols (mercaptans) and thiophenes, together with the molecular structures of the different compounds. 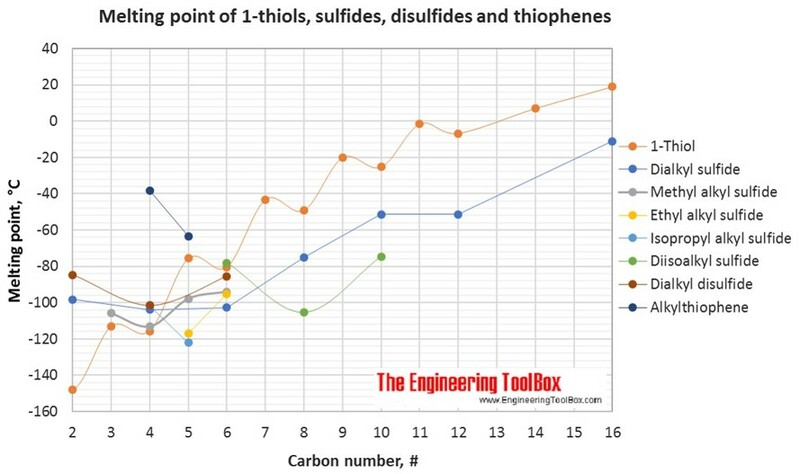 The table shows the same numbers together with the molecular weight and density, as well as the numbers of carbon, hydrogen and sulfur in the molecules. All numbers are given for boiling and melting at 1 atm (760 mm Hg). For some compounds the boiling point at 1 atm is not available. For these, the 1 atm boiling point is estimated from low pressure measurements, using a vaporization heat of 54- 70 kJ/mol (increasing with increasing BP). It is not known whether these compounds are stable at the 1 atm boiling temperature or not. Definitions of the organic classes are given below the figures. See also similar figures and tables for organic nitrogen compounds and boiling and melting point of hydrocarbons, alcohols and acids, as well as densities of organic sulfur compounds. For full table with molweight and boling point - rotate the screen! Phenyl: An phenyl group is a benzene substituent missing one hydrogen, with general formula C6H5. Benzothiophene: A polycyclic aromatic compound consisting of a benzene ring connected to a thiophene ring, with the formula C8H6S. Engineering ToolBox, (2017). Organic sulfur compounds - physical data . [online] Available at: https://www.engineeringtoolbox.com/boiling-melting-organic-sulfur-sulfide-thiophene-structure-mercaptane-thiol-density-molweight-d_1946.html [Accessed Day Mo. Year].